A grater is an essential in your kitchen. 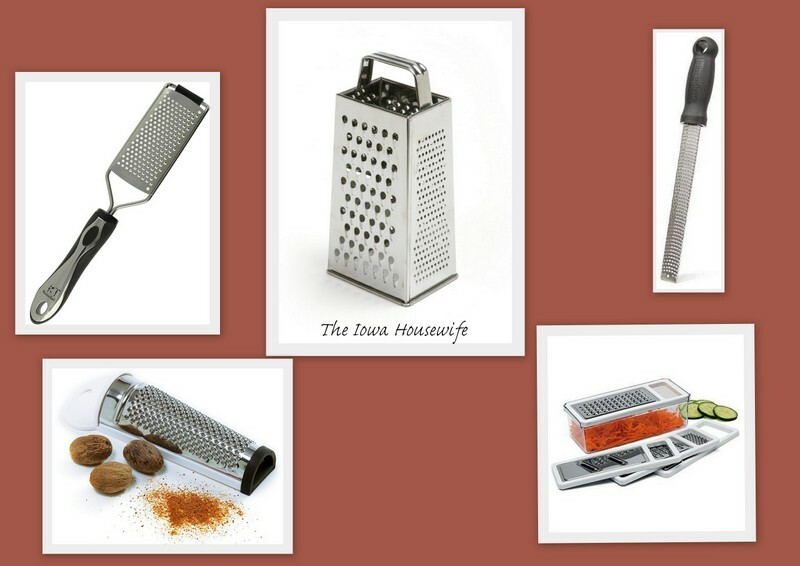 For years I used nothing but a box grater, the middle one in the photo with a handle on top. It is still my grater of choice. Most of them are four sided and have different size holes on each side. They are fast, efficient and will make your life easier. They also have a habit of grating your knuckles if you are not careful. I now own the hand grater and a rasp, the long one that looks like a file. I have had the nutmeg graters but rarely used them so don’t anymore. I bought my Granddaughter the bottom right one which is nice as all of the blades store in the container. However a drawback to these is that if you are grating a lot you have to empty the container often and it is one more item to wash. The other blades also have to be removed till you are ready to store it again. I usually grate on to wax paper or a paper plate which can than be thrown away. The box grater I have I bought in a grocery store many years ago and it works just fine. There really is no need to spend a lot of money on fancy graters as these work so well. If I was was going to buy them now I would have the box grater and the hand held grater as it is quick to use and cleans well. Remember you have to have room to store all of those neat gadgets. At least that is what I tell myself as I buy another one. I have never heard the long, narrow grater referred to as a "rasp." I think the more common term is a microplane. I have one and it makes such fast work of grating ginger (plus no fibrous bits to find in the dish!) and zesting citrus. LOVE IT. I also have the box grater and a grating "paddle" that only comes with one hole size (the same as the largest side on a box grater. So only 3 graters in my house, but they are all in constant use. I guess rasp is what our Carpenter Father would have called it so I do. Microplane is what most people would call it I guess LOL. I have a microplane. I like using it more than a box grater, which for some reason.........I hate. Should always use what works the best for you. I have lost some knuckles with a box grater over the years. I loved my first Microplane - a fine grater - so much I eventually bought the full "Professional" set - one at a time. I now have fine, coarse & extra-coarse graters as well as a ribbon grater, a large shaver and a regular shaver. I find the shavers and ribbon graters ideal for making vegetable noodles of all kinds - and now can totally ignore all those appealing ads for veggie spiralizers. Bonus - Microplanes take up very little storage space in a drawer [though I am thinking of finding a way to hang mine since I do use them a lot]. Or I'll do as a friend does - she keeps hers in a utensil crock along with her tongs, wooden spoons etc. A untensil crock is where I keep mine and find it works well for me.